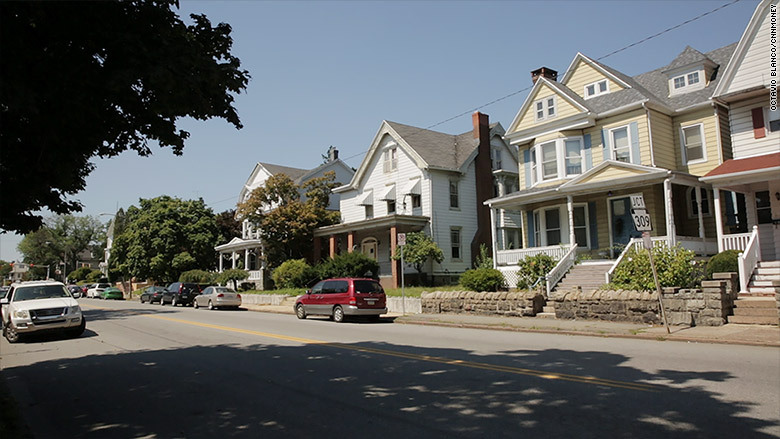 A decade ago, the small city of Hazleton, Pennsylvania, came into the national spotlight for its tough laws aimed at cracking down on "illegal immigrants." The city threatened steep fines and penalties for anyone renting a room or employing someone who was undocumented. But things have changed dramatically since that time. These days, Latinos are Hazleton's driving economic force. Since 2000, the town's Latino population has exploded from 4% to more than 40% and dozens of Latino-owned businesses have opened, providing thousands of much needed jobs. Spanish is the prevailing language spoken on Hazleton's streets, and Bachata music plays from passing cars' windows. "Before we arrived, this town was dead," said Demetrio Juarez, a chef and owner of El Mariachi, a Mexican restaurant who has lived in Hazleton for 21 years. "We gave this town life." Not so long ago, Hazleton was on the edge of extinction. The coal mines were shutting down, the older generation was dying off and younger residents were leaving town to find better paying jobs. Local lawmakers started offering generous tax incentives to attract local manufacturing companies. Slowly, warehouses, distribution centers and other plants began to set up shop in or near town. However, these companies weren't offering the type of high-quality jobs with good pay, upward mobility and pensions that residents had grown accustomed to, said Jamie Longazel, an assistant professor at Dayton University's Human Rights Center in Dayton, Ohio. Diamond Avenue, one of the main thoroughfares in Hazleton. "People that get college degrees don't tend to come back to live here," said Longazel, who grew up in Hazleton and chronicled the town's evolution in his book, Undocumented Fears. But many first and second-generation Latino immigrants saw Hazleton differently. Many of the area's jobs didn't require a higher education and the cost of living was low. Starting in the early 2000s, Latinos began moving to the town in droves. The demographic changes were startling. Hazleton's schools and hospitals began to feel the strain of the sudden influx of new residents, locals say. By 2006, the situation hit a fever pitch. Hazleton's mayor, Lou Barletta, vowed to make the city "one of the toughest places in the United States" for an illegal immigrant to live and passed the Illegal Immigration Relief Act Ordinance. Under the law, landlords who were found to be renting to undocumented immigrants could be fined up to $1,000 per day. Companies could also be penalized if they hired undocumented workers. And tenants were also required to prove they were lawful residents and register with the city. Demetrio Juarez has owned his restaurant in West Hazleton since 2002. "When Barletta was mayor, there was a lot of fear. People wouldn't come eat here anymore," said restaurant owner Juarez. "Now it's different. The new politicians don't go against the immigrants." Barletta, who is now a U.S. Congressman, maintains that his position is "decidedly pro-immigrant." "Because who is hurt the worst when people who have broken immigration laws come to this country seeking employment? It is the legal immigrant -- and other legal workers -- who will be in direct competition with illegal immigrants for jobs that are already scarce," Barletta wrote in an email to CNNMoney. The ordinances were ultimately ruled unconstitutional by a federal appeals court in 2010. "What is disappointing in the entire saga, however, is the fact that the Supreme Court declined to hear our case," Barletta went on to write. "I consider these people coming in as new blood," said Carmen DeLese, an 84-year old Hazleton native who owns Carmen's Bakery on Broad St. "We have a lot of small Hispanic stores opening up. They're working, they're paying taxes." he said. 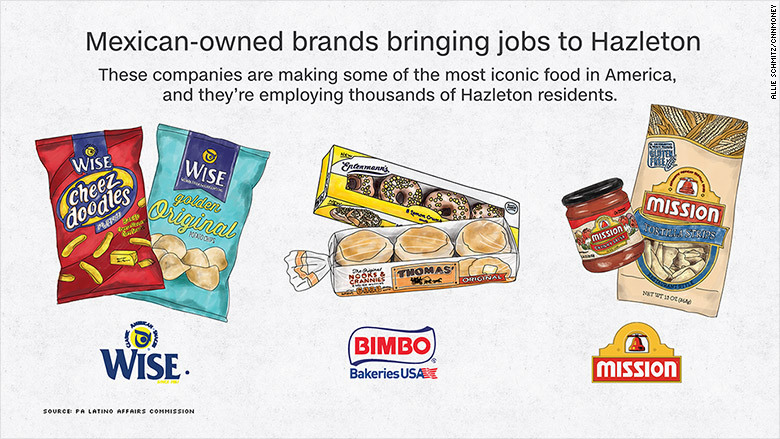 Not only are many of the city's small businesses owned by Latinos, but three of the area's biggest employers -- Bimbo Bakeries USA, Mission Foods, and Wise -- are Mexican-owned companies. Together, these companies employ about 5,000 workers, said Francisco Torres-Aranda, the region's commissioner of Latino affairs. Torres-Aranda, a dual Mexican and American citizen who was born in Hazleton, also owns Advanced Tech, an research and development facility for shale drilling products. "It's incredible that Hazleton, which was the epicenter of the [anti-illegal immigration] rhetoric that we're hearing now, is actually a place where Mexican-owned corporations are creating jobs for everyone," said Torres-Aranda. "Five or six years ago, we didn't have a Lowe's or Wal-Mart or a Giant Supermarket with 24-hour service," said Amilcar Arroyo, a 30-year Hazleton resident and editor of El Mensajero, a monthly Spanish Language paper. "They just built a big car dealership with four big brands in Hazel Township." Among Hazleton's largest employers are a Cargill meatpacking plant and an Amazon.com distribution center, Longazel said. Still, the town has a ways to go. The unemployment rate, which hit a peak of 17% in July 2012, has fallen to around 10% -- but it is still well above the national rate, according to the Bureau of Labor Statistics. And median income, at $16,871 in 2015, is also well below the national median, according to the Census Bureau. But with big new investments and improvements in downtown Hazleton, locals are optimistic. "We just redid the whole downtown Broad Street roadway. It was a $36 million dollar project through the heart of the city," said Hazleton's new mayor, Jeff Cusat. "Now there's businesses popping up on both sides of the highway there." 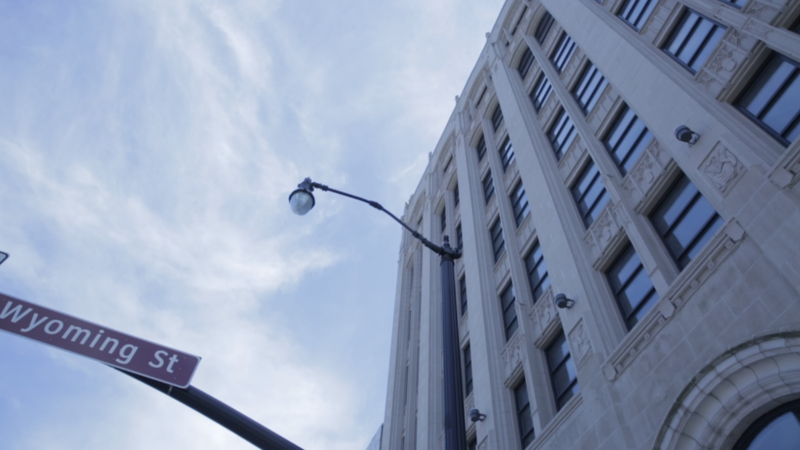 Also, three buildings that were left for dead are being converted into office space. "So that's another $20 to $30 million project," he said. "The new mayor has good relationships with the Hispanic community here and there are many opportunities to expand their businesses in this city," said Ben Medina, a local community organizer. Medina is the executive director of Hazleton One Community Center, which offers Spanish and English classes, after school and GED classes and other programs for the Hazleton community. "There were definitely lessons that we learned from the fight with Barletta," said Juarez. "We won't let ourselves be intimidated, especially by politicians who want to hurt us and make us feel like we're less-than."